Mossis Madu isn’t in this picture, but he’s clearly in the big picture. Ink on paper never meant much in August, but for those obsessed with the Bucs’ running backs competition, LeGarrette Blount appears as the starting running back on the depth chart just released for Friday’s preseason opener in Miami. 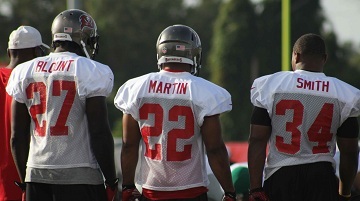 Doug Martin is second. Mossis Madu is third. Joe’s not naive enough to believe this means much, but it does mean something. Interestingly, Madu is looking more and more promising. He’s spent his share of time with the first team during training camp, OTAs and minicamp, and Mike Williams gave him an intriguing shout yesterday. Madu has been running on all special teams, mostly with the second units. So how about the real question, Mossis. Are you faster than rookie RB Michael Smith? “No, no, man. That man’s real fast. I’m not lining up to race him,” Madu said. However, it appears that right now Smith is chasing Madu. I have a feeling this team is gonna whip the hell out of the dolphins. these guys sound like they are already in mid-season mindset. how many Rb’s we keep? thought it was 5 ? We’ll keep 4 RB’s – Martin, Blount, Smith and Madu. You won’t see Madu or Smith on the practice squad, they would get snatched up in a hurry. Has Thomas been right about anything this year??? First it was Okoye was picked up to replace McCoy then it was Blount could never start…. On the real side though, I believe that Martin will have that starting job by the time the season starts. It’s just good to see that Blount has made enough progress that Schiano feels comfortable starting him in the new scheme which will obviously require pass blocking. Now, if they start to bring Martin in on third down situations it will still be unpredictable because Martin can both run and catch so they can’t just pin their ears back and blitz or they could get burned real bad on a delayed handoff or a check down to Martin. The nice thing about Martin as opposed to Lumpkin is that he can do it all and bringing him in doesn’t necessarily mean pass. Good to keep the defenses guessing instead of last year when even the fans were calling the plays ahead of time. Depth chart at this point doesn’t hold much weight. Lets see what it is going into the 3rd and 4th preseason game before we make any assumptions. Right now, Blount is the proven guy until the shiny new running back has even played a game. Huggins and Cadillac were running circles around people in practice as well. So what kind of role will Smith play? With that speed you would think he would return kicks and pints. Of course…he returns them empty. This will not do any good nor change anything, but I’m going to say it anyway. Why does the NFL still have this archaic 53-man roster limit and a salary cap? NFL teams have experienced intelligent owners, FOs, and coaches who know to manage capital and human resources. A team is allowed 90 players in TC, and should be allowed to have as many players as they want as long as they adhere to the salary cap and player salary guidelines. To insure that the best product is put on the field, they should limit teams to dressing 53 players for a game or even 46 players as is used today. This invalidates the need for a PS, which is nothing more than a recruiting station for other NFL teams. The Salary cap, player salary guidelines for rookies and veterans and the marketplace for FA will naturally induce roster sizes for NFL teams. It should not be forced! @Macabee…The salary cap is not archaic, it keeps the teams somewhat equal. It keeps teams from buying championships. It levels the playing field, or whatever you want to call it. I would say it keeps teams from forming dynasties, but NE seems to be the exception. 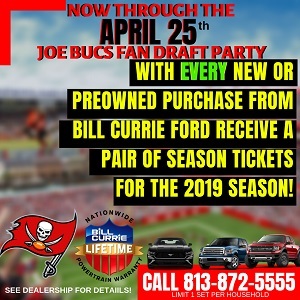 I am sure the owners do not want to pay 90 guys anyway. Things may be wrong with the NFL, but roster size and cap are not part of it. In my opinion anyway. If we have learned anything from the off season its that Schiano is not going to give our opponents any kind of knowledge of our team. That includes the depth chart. He works in secrecy. I dont think the plays or the schemes we see in pre season will be seen in the regular season, or atleast not much anyways. As he said this depth chart means nothing at this point. I apologize. My opening statement was not clear. I am not questioning the salary cap. I like the salary cap. I was attempting to say we have salary cap that works. Why do we need to arbitrarily set a 53-man limit? Please re-read my previous post, I think it will make more sense even if you don’t agree. August Depth Chart = Boring. Call me in Nov/Dec.